A lovely Carmona microphlla (Oriental Tea Tree) indoor bonsai with dainty white flowers and pretty trunk flow. Our premium range indoor bonsai have beautiful ceramic pots with matching drip trays. 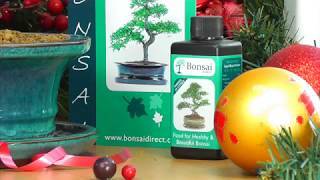 This beautiful Christmas bonsai gift for sale is also supplied with bonsai feed, care instructions, pruning scissors and Merry Christmas log. Very pretty and you can choose Christmas delivery at the checkout. Delivery is free to most of the UK and you can choose gift wrap and personalisation options below. The Oriental Tea Tree (Carmona microphylla) displays beautiful white flowers and deep green glossy leaves on a lovely twisty S-Shaped trunk. This artistic Christmas gift includes a matching ceramic drip tray, bonsai feed and pruning scissors. A Merry Christmas log pick and care instructions are included. Very prettty and highly recommended. * Pot details: Forest green oval ceramic bonsai pot.